Before I mention who the lucky person who has one "Once Upon a Princess" Cartridge AND the paper, I want to explain/apologize. I (stupidly) forgot to mention not once but twice, on my post and in my video, that it is one comment per person. Due to the fact that I did not mention this, I have to count ever comment(besides the ones that I commented on) as 1 comment. So I really want to apologize to all of the followers who left only ONE comment---it isn't any one's fault but my own that I forgot this detail :( . I promise to be doing another giveaway in the near future....((maybe when I hit 400 subscribers)) and I'll be sure to mention that! So......I also want to thank all of you ladies who left some amazing comments!! It was nice to receive some great words from some of close blogging friends (Momo, Cristi, Sarah!) and from all you new and old followers who left such amazing words! Words can convey SO much, you have really inspired me to keep on pushing through my creative halt to create more stuff for you all! Thank you soooo very much to my NEW followers! I'm glad that you like my creations and have decided to subscribe to my blog. Jesse (my hubby) was in shock when in the first night of the blog hop, I received 100 new subscribers! So THANK YOU THANK YOU THANK YOU!! "I'm already following your blog. I love it. Great cards, great give away. Thanks for sharing." CONGRATS LOLIS!! Now all I need is your information so that I can send out your package tomorrow! Please email me at onethirdchicklet@gmail.com with your information!!! Thank you everyone for participating!!!! 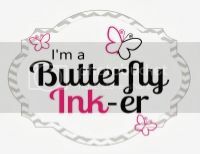 It was a pleasure to join our Wonderful Host Sara at Pinkcricut.com on this hop! I hope to do many more and I'm going to get back to creating! CANT WAIT! oh...and PPS.....Spinner Card tutorial will be up by tonight! Back to School Blog Hop!! !